At RICHARDSON EYE ASSOCIATES we're prepared to meet all of your vision-correction needs. Contact lens evaluations, prescriptions and management are central to the vision-correction services we provide. After a comprehensive eye examination, the doctor will discuss the variety of contact lens options that are available for you, and together you can determine the type of lens and wearing schedule that best fits your eyes and your lifestyle. Even if you suffer from dry eyes or allergies, with proper fitting and management, you may still be able to wear contact lenses. Prior to prescribing contact lenses, the doctor will perform a comprehensive eye examination that not only assesses the health of your eyes, but enables him to determine if you have any conditions that might contraindicate contact lens wear. After all, the long-term health of your eyes is the most important consideration in determining the appropriateness of contact lens correction for you. If you suffer from dry eyes or allergies, those conditions will need to be addressed during the fitting process. Your refractive error (commonly known as nearsightedness, farsightedness, or astigmatism) is thoroughly evaluated as it determines the type of contact lens you will require. With proper care and management, patients of all ages can wear contact lenses, including children (with close supervision) and those over 40 who need bifocal correction. Contact lenses are available in either soft or rigid gas permeable form, although most patients today, especially new wearers, wear some variety of soft lens. Gas permeable hard lenses, however, are still worn by many patients. Some were fit many years ago before soft lenses reached the level of sophistication they enjoy today, while others wear them because their vision can be best corrected by a rigid lens. Some contact lenses need to be changed daily, while others are changed weekly, bi-weekly, or monthly, depending on the lens type prescribed. With proper supervision, some lenses are even safe to sleep in for days or weeks at a time. 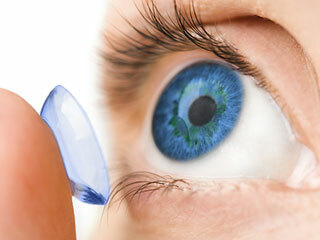 Specialized contact lenses like bifocal, multi-focal and toric (for astigmatism) contact lenses, are also available. In rare instances, special contact lenses can be used to treat eye diseases (therapeutic) or as bandages for eye injuries. Advances in contact lens technology have created great options for cosmetic and prosthetic lenses. Prosthetic lenses can be created to camouflage scarring and irregularities caused by disease or trauma to produce a more natural looking eye. Cosmetically tinted contact lenses are also available for those who would just like to change the color of their eyes.